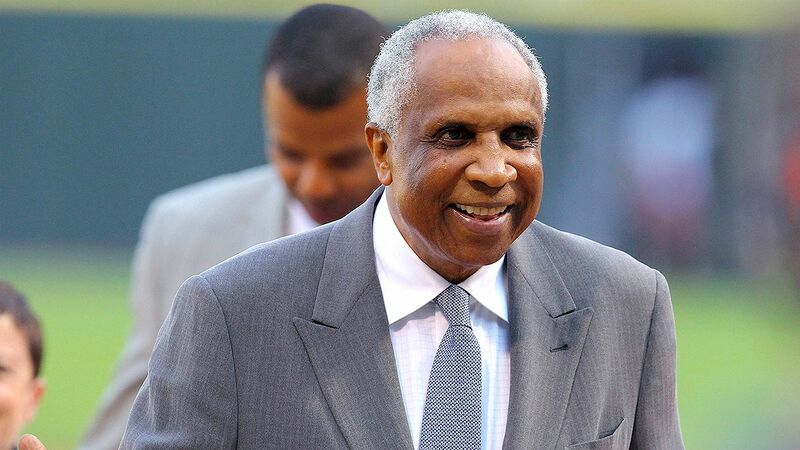 Frank Robinson, the first African-American manager in Major League Baseball and the only player to win MVP in both leagues, has died at age 83, MLB said Thursday. An outfielder and first baseman, Robinson was inducted into the Baseball Hall of Fame in 1982 in his first year of eligibility. A fearsome hitter, Robinson ranks 10th on the career home run list with 586. He won the Triple Crown with the Orioles in 1966 and became the first black manager in MLB history in 1975 with the Cleveland Indians. He also served as MLB’s executive vice president of baseball development, with his focus on increasing African-American participation in the sport. He later served as a senior adviser to commissioner Rob Manfred. Robinson was born in Beaumont, Texas, but grew up in of Oakland, California, where in his high school he was captain of a state championship basketball team with Bill Russell — who would go on to be the first black manager in the NBA — as his teammate. Robinson won his first MVP in 1961 when he helped lead the Cincinnati Reds to their first pennant in 21 years. He hit .323 with 37 home runs and 124 RBIs and led the majors in slugging (.611), OPS (1.015) and intentional walks (23) for a 93-61 Reds club that lost in the World Series to the New York Yankees. After a 10-year stay with the Reds that included a 1956 Rookie of the Year award, the 1961 MVP and a Gold Glove, the 30-year-old Robinson was traded by Cincinnati to the Baltimore Orioles ahead of the 1966 season. Despite coming off a 33-homer, 113-RBI season in 1965, Robinson was called an “old 30” by Reds owner Bill DeWitt and shipped to Baltimore. In return, Cincinnati received pitcher Milt Pappas and two other players — none of whom came close to the stature of Robinson. In his first season in Baltimore, Robinson showed he still had plenty left in his 30-year-old body as he was named the AL MVP following a 1966 campaign in which he won baseball’s Triple Crown. His MLB-best marks of 49 home runs, 122 RBIs, .316 batting average and 122 runs scored helped carry the Orioles to their first World Series title. Robinson played five more seasons in Baltimore and finished in the top three of MVP voting twice more before he split time from 1972 to 1974 with the Dodgers, Angels and Indians. After concluding the 1974 season as a member of the Indians, Robinson made history in 1975 as the first African-American to be named manager of a major league club, while he was still playing. Though paid only an additional $20,000 to handle both jobs, Robinson took the position knowing his place in history. However, Robinson was also aware of the challenges he would face as the league’s first African-American manager. “I knew there was going to be an awful lot of pressure, a lot of expectation and a lot of unhappy people because when things went right, fine, but when things went wrong, it was going to be doubly bad because of me being the first black manager,” Robinson said. Robinson retired from playing after the 1976 season, but his managerial career was just beginning. He remained the Indians’ manager for the 1977 season and was honored by the franchise in 2017 with a statue outside of Progressive Field. He also served as manager for three other clubs: the Giants (1981-84), Orioles (1988-91) and Expos/Nationals (2002-2006). Robinson later led the Expos/Nationals franchise through its move from Montreal to Washington. Robinson was named the AL Manager of the Year with the Orioles in 1989 — the same year he took part in history by coaching against the Blue Jays’ Cito Gaston in the first games featuring two black managers. Robinson was 1,065-1,176 over his 16 years as a manager, and though he never made the playoffs, he also mentored Dusty Baker and Joe Morgan, who would follow in his footsteps. While Robinson dealt with racism and segregation during his career and broke barriers as an African-American manager, he said his accomplishments pale in comparison to those of Jackie Robinson. Though the two men were unrelated, they were often mentioned together. When he arrived in Baltimore, Robinson and his family struggled to find housing in the city, with many landlords refusing black tenants. He eventually settled in the Ashburton neighborhood in a house on Cedardale Road. Six months later, after Robinson won the Triple Crown and led the Orioles to the pennant, the mayor of Baltimore held a ceremony to rename the street “Robinson Road” for the duration of the World Series. The Robinson family has asked that in lieu of flowers, contributions in his memory can be made to the National Civil Rights Museum in Memphis or the National Museum of African American History and Culture in Washington, D.C.